back in august, i read the book THE DEATH AND LIFE OF CHARLIE ST. CLOUD and i liked it enough that i was looking forward to watch the movie. so i did. after a few months of waiting, CHARLIE ST. CLOUD is now showing in theaters. i wish i could say it was worth the wait. 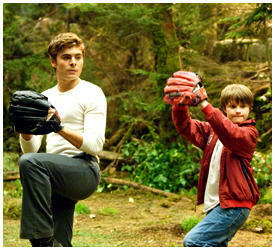 first, a recap: CHARLIE ST. CLOUD is the story of charlie, a young man who blames himself for the death of his younger brother sam. he makes a promise to his younger brother that he will never let him go. and he never does. until he meets a girl named tess. and then charlie begins to wonder if there’s something in life he’s missing. this premise remains in the movie, but for some reason, it doesn’t feel like the same story. i have this belief that books and movies are separate things, even when they have the same story. i like to pretend that this is so, so that i don’t get disappointed when the movie fails to meet my set expectation. for the most part this works. it didn’t work with CHARLIE ST. CLOUD. that’s because the movie wants to tell the exact same tale as the book–but it changes a lot of small details that it doesn’t live up to the original story. now, these changes doesn’t really matter if you compare the book and movie side-to-side. the movie’s main plot, of charlie having to choose between life and death, is still the same as the book’s. but because of these changes, the movie feels disjointed, with a lot of superfluous scenes. one. in the book, charlie and tess are high school classmates, but they only meet again when charlie accidentally disturbs tess at her father’s grave. in the movie, charlie and tess have three other chance meetings before charlie accidentally disturbs tess. it really shouldn’t matter, but these three scenes feel too much like a set-up. which they are. but they’re really not needed as you don’t care much about tess until after that disturbance at the graveyard. that, and the fact that the change in first meeting also affects how their story ends. two. in the book, tink is a caring friend who would do everything to help tess. in the movie, you don’t even feel his presence. in fact, an opportunity for drama is missed when they degrade tink’s character from charlie’s foil, to a plot device that would get charlie pushing to search for tess. three. in the book, tess can see sam. and sam even gives his approval for charlie to start dating tess. and this is the biggest “small” change they had done in the movie. because in the movie, sam doesn’t like tess. and we don’t even get an inkling that tess can see sam. now, for you spoiler-phobes, that’s something they already showed in the trailer. so technically, it’s not a spoiler. technically. take from that what you will. back to the point i was making. by making sam not like tess in the movie, you make charlie unlikeable when he starts choosing between sam and tess. sure, a person should always choose to live in the present and not the past, but that doesn’t make tess look any better when she “forces” charlie to pick between her and his dead brother. the conflict in charlie is more real when charlie has to choose between the brother tess likes, and the girlfriend his brother likes. neither one will want the other gone. and charlie knows that whoever he picks would live with the fact that he picked him/her over the other. it’s a heavier conflict. because both choices affect each other. whereas in the movie, the choices are of different worlds: one in the world of living, the other in the world of the dead. which one would you pick? it’s not a hard decision, right? so yes, i have serious issues about the movie. 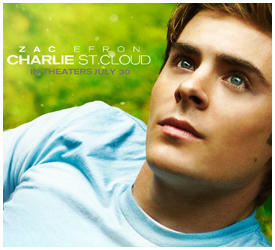 and there i was thinking zac efron was perfect for the role of charlie st. cloud. it’s too bad that he played a different version of charlie.